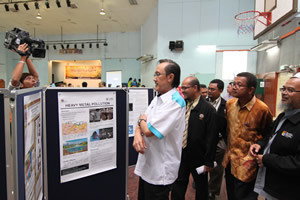 RANAU SABAH, 8 Feb. 2012 – The Sabah government appreciates efforts of the National University of Malaysia (UKM) to get the local population to be more conscious of the effects of development on their environment. The State Minister of Tourism, Culture and Environment, Datuk Masidi Manjun opening a two day seminar on the environment at the community centre here yesterday said Ranau is known as the centre for tourism in the state especially in the Kundasang area where Mount Kinabalu is situated. There was thus a need for greater attention in the efforts to preserve the environment in the face of intensive development for tourism in the area. 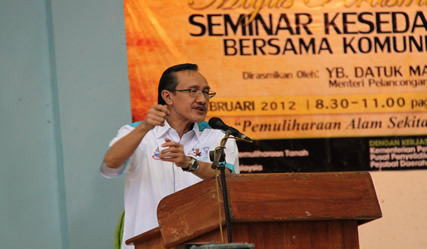 In his speech mostly in Dusun, Datuk Masidi said among the pressing issues over the environment in the area are land slides due to natural phenomena as well as the opening up of land for agriculture and the building of hotels and chalets to meet the increasing demands of the tourism industry. He said vast areas of land in Kundasang are unstable due to their steep terrain and those involved in tourism and agriculture needed to be more sensitive to the situation by complying to the various regulations to minimise the negative effects of such development on the environment. He referred to the tragedy at a resort in Kundasang last year which should be an eye opener to what can befall if development is carried out without being sensitive to the needs to preserve the environment. Thus the Sabah state government is desirous to get the local population to be more conscious towards the preservation of their environment which should not be neglected in their desire to open up land to meet such demands. The programme to get the people to be more conscious of their environment include the seminar organised by the Land Restoration Research Group of UKM in collabolration with the Sabah Government, University of Malaysia Sabah (UMS), the Ranau District Office, District Education Department of Ranau and the Institute of Climate Change (IKLIM) UKM. The seminar was attended by about 300 participants including heads of department, government officers, NGOs and the people of Ranau discussing a number of papers by UKM and UMS researchers and government officers involved in the management of steep slopes, highland agriculture, land slides, rehabilitation of rivers, climate change and the role of the community in preserving the environment. Present at the ceremony were Prof Dr Mohamad Deraman representing the UKM Vice Chancellor; Associate Prof Dr Baba Musta, Dean of the School of Science and Technology UMS and the Ranau District Officer, Haji Faimin Kamin.